The arrival of iOS 5 last fall brought with it the ability to manage your to-dos in the form of the built-in Reminders app. Reminders won’t threaten the many task management utilities available from the App Store—Apple’s built-in tool is really geared more toward storing simple lists for shopping, packing, and the like. But there are some time- and location-based tricks you can master with Reminders on your iPhone, iPad, and iPod touch. Here’s a quick guide on how to make the most of the app. On the iPad, Reminders shows your available lists at all times. When you first launch Reminders, you’ll see, by default, a blank list; the name of that list, appropriately enough, is Reminders. You can create multiple, separate lists in Reminders, and assign individual tasks to any one of them. On the iPad, your lists are always visible on the left-hand side of the screen. On the iPhone, simply tap the lists icon—the three parallel horizontal bars at the upper left—to expose your lists. To add a new list, tap the Edit button. Then, tap the Create New List link and start typing your new list’s name. Tap Done when you’re finished. While in Edit mode, you can also rename lists, or use the handles to reorder your lists. Tap the Done button at the top left to exit Edit mode completely. On the iPad, switching between lists is simple: Tap the list name at left, and that list’s contents will immediately appear on the right. iPhone users have a couple of options for list-switching. The first is to tap the lists icon at the top left, and then tap the specific list you’re after. The quicker solution, however, is to swipe horizontally across the current list to flip to the next one. Pagination dots at the bottom of the screen indicate how many lists you can swipe through; the leftmost list is your Completed list, which aggregates all the tasks you check off as done. Your task can take whatever form you’d like. Your groceries list might contain entries like Eggs, Milk, and Peanut Butter Cups; your Reminders list might instead include items like Get a Birthday Present For Uncle Jim and Take Out The Recycling Cans. When you’re finished typing in your task, it’s not entirely obvious what precisely you should do next. As is so often the case in Reminders, you get two choices: You can tap the Return key on the virtual keyboard, or you can tap the Done button at the upper right. You can schedule Reminders to alert you at a specific time, when you arrive or depart a specific place, or a combination of both. If you want to save other details for your reminder—add a specific time or location at which the reminder should be triggered, schedule a recurring reminder, move it to another list, or add other notes—you need to tap your newly-added entry. From the Details screen that appears, you can tap the Remind Me button to schedule a time- or location-based reminder. To set a time-based reminder, slide the On a Day switch to on, and then choose the date and time your Reminder should sound. Only tasks for which you have scheduled reminder times can be set to recur, repeating the reminder again at daily, weekly, biweekly, monthly, or yearly intervals. Slide the Location slider to On, and you can schedule your alert to sound when you arrive at or depart from a specific location. Reminders, by default, assumes you want your reminder to relate to your current location. If you want it to remind you when you arrive at (or leave) somewhere else, tap Choose Address. You’re limited to addresses in your Contacts list. Thus, you may end up adding some extra contacts, like Work or School—complete with their addresses, of course—so that you can more easily get Reminders to alert you to pick up certain items when you’re near those establishments. Here’s how: Launch the Contacts app, and then tap the Plus (+) icon at the upper right. You can put the name of the school, workplace, store, or any frequently visited site in the Company field, add a phone number or skip it, and then scroll down to the field marked Add New Address. Tap that, and then type in the address of your frequently visited place. When you’re finished, tap the Done button at the upper right. From now on, you’ll be able to use your just-added business as a location for such a Reminder. If you don’t mind a slightly cluttered Address Book, it’s a great means of making sure you remember to buy lightbulbs when you’re near Home Depot. If you assign your reminder a priority, the Reminders app remembers that, but does nothing with that information—you can’t reorder your tasks, and higher priority ones don’t move to the top of your list. You will see those priorities reflected only if you review your todos at the iCloud website. 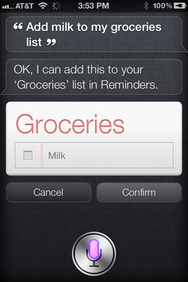 Siri integrates quite well with Reminders on the iPhone 4S. Remind me to water the plants, every day, at 7 a.m.
To change which list Siri puts new reminders on if you don’t specify one, head over to the Settings app. Reminders settings are, confusingly enough, found in the Mail, Contacts, Calendars section of the Settings app. You get only two options: Sync and Default List. 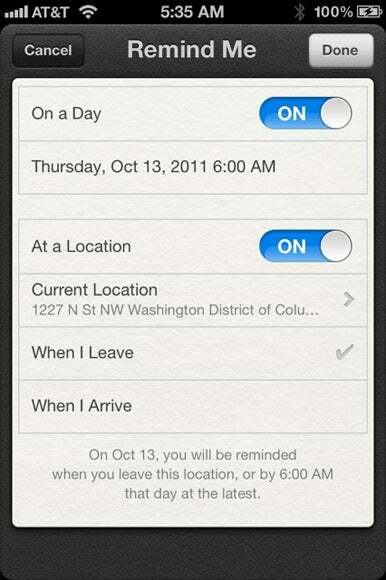 Sync determines how far back your reminders are synced. You can choose to sync reminders from two weeks to six months back, or to sync all reminders. The default value is a single month. Default List determines which list new reminders that you add outside of the Reminders app will go to. In truth, however, at this writing we’re not aware of anything that this setting affects otherthat reminders you add with Siri, when you don’t specify a specific list to put them on as you speak. As we’ve covered before, you can set up shared lists in Reminders using iCloud. To set up a shared list, you need to go back to the iCloud website. When other folks accept your shared list, anyone can add, delete, or check off reminders on that list; the full instructions are in the linked story. Shared lists are a big help for certain kinds of lists. You and your significant other might choose to create a shared shopping list; that way, you can each add items to the shared list, and whoever hits the supermarket first can check off any purchased items. Even if you don’t end up creating a shared list, iCloud syncing for Reminders includes an added benefit: If you use multiple iOS devices, iCloud keeps your reminders in sync on every iPhone, iPad, and iPod touch you use.